System Optimizer Pro is the PUP that uses misleading techniques to prevent removal. Use Reimage to locate malicious components and get rid of them faster than with uninstall instructions. A full system scan blocks virus reappearance and prevents traffic to malicious domains. Want to fix computer errors? Buy System Optimizer Pro license! 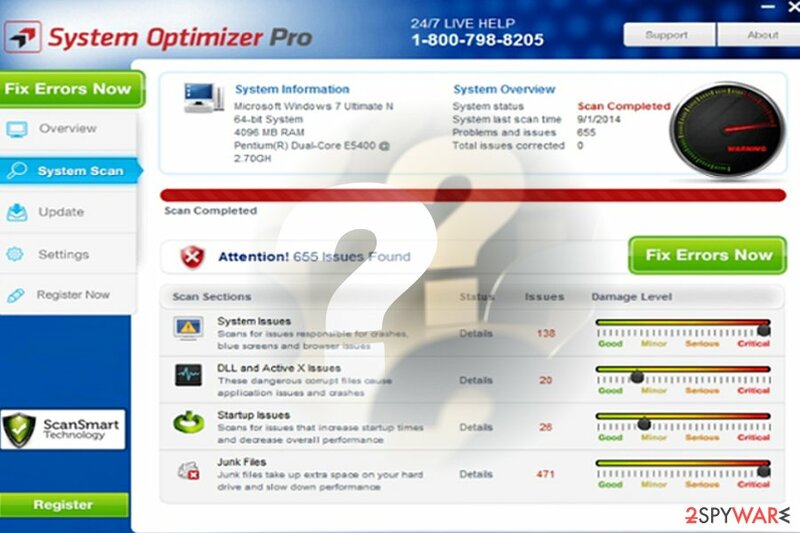 System Optimizer Pro by 383 Media Inc. is a PC optimization program that claims to clean computer and fix system and registry errors. However, security experts noticed negative features of this tool that puts it into the category of potentially unwanted programs (PUPs). Besides, computer users often mistake it with PC Optimizer Pro. The latter app is also known for causing troubles. This free program also offers tech support. If users have some problems with a program, they can call 1-800-798-8205.All might seem fine and dandy, but soon the software reveals its nature. When you attempt to fix the found issues and problems, an additional window appears asking you to purchase the full version. By purchasing the full System Optimizer Pro version, you solve not the real issues but fake ones. This is purely a marketing technique. However, the software might make the system more vulnerable as it fails to optimize the system properly. In other words, there are only a few programs which might indeed boost the performance of the system. After all, the fewer questionable apps reside on the system, the better. Therefore, you should remove System Optimizer Pro. The key feature of all questionable optimization tools is to persuade users that their operating systems are in need of technical assistance. Unfortunately, less advanced or senior users alerted with hundred of fake issues might indeed purchase the full edition of System Optimization Pro. Experts from Hungary do not recommend buying the full version of the program because it’s not only the waste of money, but you may easily reveal your banking information to third-parties too. The full version does nothing except that it eliminates fake messages. While this program does not behave maliciously, some cases of rogue security tools exhibit aggressive behavior. For instance, Windows Antivirus Helper, even meddled with real security applications preventing them from functioning properly. However, some users report that the program appeared on their computers out of nowhere and started displaying threatening system scan results. Indeed, the program might be installed in the software bundle. If it happens to you too, you should perform System Optimizer Pro removal using professional malware removal program, such as Reimage or Plumbytes Anti-MalwareMalwarebytes Malwarebytes. Therefore, System Optimizer Pro hijack might occur if you download some freeware or shareware using Quick/Recommended setup. Therefore, if you are surprised by software’s appearance, you should be more careful with the installation of free programs next time. Now it’s time to get rid of this tool. This doubtful application may not only cause annoying ads during your browsing. It may also negatively affect your computer's performance by consuming lots of PC's resources. In order to avoid that, you should follow these simple steps and remove System Optimizer Pro from the system. Some users reported having difficulties uninstalling the PUP. If you happen to be one of them, it is recommended to perform System Optimizer Pro removal in Safe Mode. Windows 7 users can enter the mode by tapping on F2 before Windows logo appears (before booting into the OS). Windows 10 users can do it in two ways. Type System Configuration and then launch the app, choose Boot section and check the box safe boot. Restart the system. You can deactivate the mode the same way by unchecking the box. Reboot the device several times to activate Advanced settings menu. Then you will be able to enter Safe Mode. After you enter the mode, go to Settings, Apps and Features (Programs and Features in Windows 7), find System Optimization Pro and uninstall it. In case you find any difficulties uninstalling the program, use malware elimination tools to eliminate the PUP completely. We recommend choosing Reimage, Malwarebytes MalwarebytesCombo Cleaner or Plumbytes Anti-MalwareMalwarebytes Malwarebytes. ^ Jaikumar Vijayan . 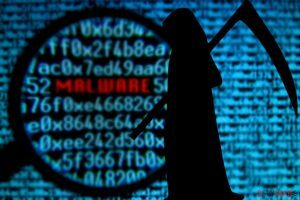 Malware Alerts Prompt Google to Purge Android Apps From Play Store. eWeek. Technology News, Tech Product Reviews, Research and Enterprise Analysis. ^ Eliminate computer viruses. Virusi. IT News and Malware Removal Guides in Croatian. ^ James Andrews. Revealed: How criminals steal your card details and how to beat them. Mirror Online.The latest news, sport and celebrity gossip. ^ Rogue Antivirus Software. 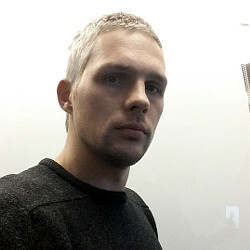 KasperskyLab. Kaspersky Antivirus Protection and Internet Security Software. This entry was posted on 2017-09-28 at 02:57 and is filed under System tools, Viruses. You can quickly scan the QR code with your mobile device and have System Optimizer Pro manual removal instructions right in your pocket. How did you remove System Optimizer Pro?